Grease two 9-inch cake pans with non-stick cooking spray and flour, and line with parchment paper circles. In a medium bowl, whisk together the flour, baking powder, and salt until well combined. Using a stand mixer fitted with a paddle attachment, cream butter and sugar on medium-high until creamy and light (about 3-5 minutes). Reduce speed and add eggs one at a time, fully incorporating after each addition. Add vanilla until combined. Pour the batter into the prepared cake pans, gently pound pans on counter top to spread out cake evenly. Bake for 30-35 minutes or until a toothpick inserted into the center comes out mostly clean. In the bowl of an electric mixer, cream the butter, mascarpone and heavy cream until creamy and well combined. Gradually add 3 cups of confectioners’ sugar, and then beat in the vanilla and salt. Scrape the sides, and taste buttercream. For a sweeter frosting, continue adding remaining sugar or if reached desired taste, transfer to bowl until ready to use. 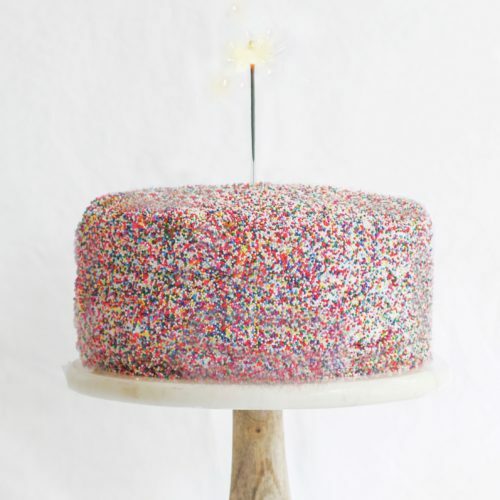 Remove cake from refrigerator and place one layer on a cake stand or serving plate. Top with approximately 1 cup of buttercream. Top with remaining layer, and frost the top and sides of the cake until smooth. Place cake stand on a sheet pan. 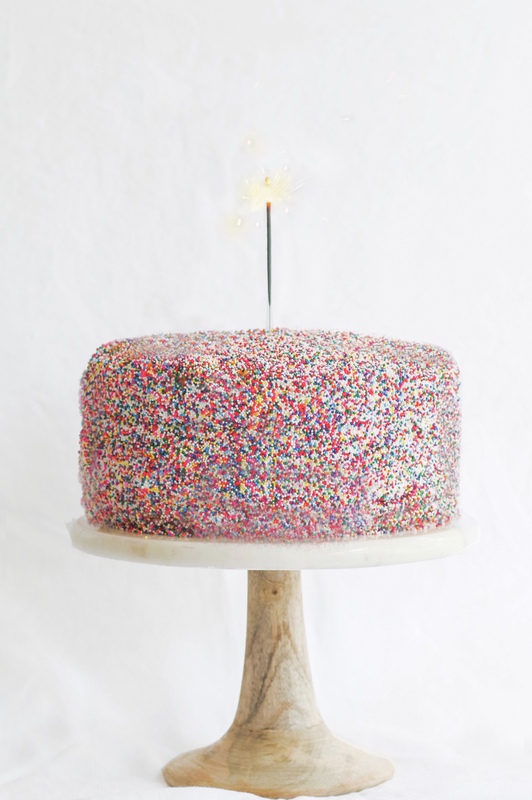 Gently start pressing sprinkles, starting with the sides of the cake, working your way up; making sure that the cake is completely and thoroughly covered.